I really like photography. 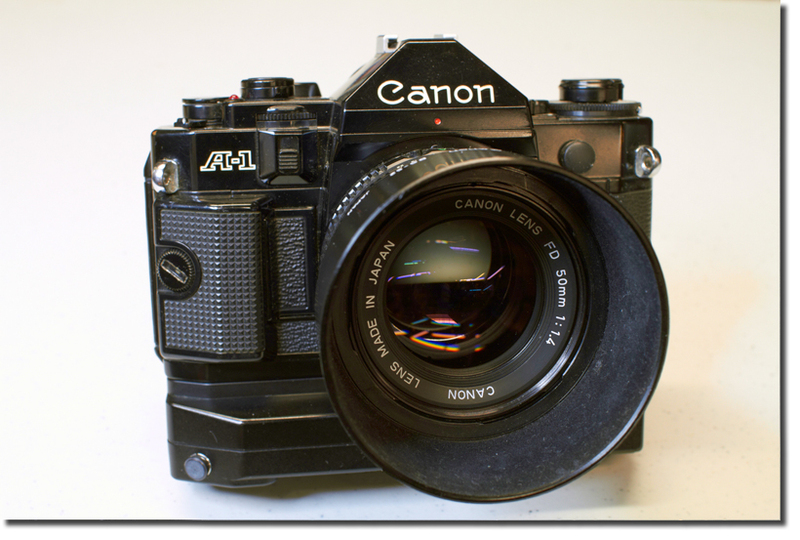 My first real camera was a film SLR; a Canon A-1. I purchased it in 1980 just before my first child was born. I loved that camera. It was the first multi-mode SLR – Aperture priority, Shutter priority and Manual. This should not be confused with what was probably the most popular camera of that period, the Canon AE-1. The AE-1 was shutter priority only. I had collected several nice FD lenses (manual focus): 50mm f1.4, 70-210mm f4.5, and 35-105mm f3.5. I even had the film winder. My old camera has been sitting in its bag for years now, ever since I purchased my first digital camera. I took it out the other day and noticed how the leather case was drying out and falling apart. I ditched the case and just enjoyed handling it for a while (no I didn’t shoot any film). As it lay on my desk I thought about what a waste it was just sitting there. My son has a Canon DSLR, but his collection of lenses is somewhat limited. We researched a bit and found a nice adapter ring that allows the use of FD lenses on today’s modern DSLRs. There are a few caveats – magnification, loss of light, and manual exposure only, but overall they are still useful. He immediately grabbed the 35-105 and the 70-210. He already had a 50mm f1.8 EF lens and the 18-55mm f3.5 kit lens (both auto focus and aperture). I’m glad the old lenses are getting some use now and being forced to shoot in manual requires you to think more about your shot and pay attention to the exposure. It’s like a mini course in photography. This brings me to the leftovers – A-1 body, 50mm lens, and the winder. I have a lot of toys on my desk and the old A-1 seems to fit right in. I like just looking at it and picking it up every once in a while. I think it’s found a new home……. This entry was posted on 13 April 2011 at 4:39 pm	and is filed under Technology. You can follow any responses to this entry through the RSS 2.0 feed. You can leave a response, or trackback from your own site.